To spark discussion, the Walker invites Twin Cities artists and critics to write overnight reviews of our performances. The ongoing Re:View series shares a diverse array of independent voices and opinions; it doesn’t reflect the views or opinions of the Walker or its curators. Today, composer, producer, writer, and filmmaker Chris Strouth shares his perspective on Kid Koala’s Nufonia Must Fall at the Walker Art Center last weekend, a performance copresented by the SPCO’s Liquid Music series. Agree or disagree? Feel free to share your thoughts in comments! There are things that can’t really be described, in part because we don’t have a language that can accurately explain what it is that we have witnessed. Nufonia Must Fall is one of those things. The simple explanation is to say it is “a motion comic animated in real time with a live soundtrack.” I fear that is about as descriptive as calling War and Peace an adventure story. It might be easy to pigeonhole Kid Koala (Eric San). Musically he was an architect of the new alternative hip-hop/turntablist movement of the late ’90s, with a discography that is chock full of some of the high water marks of the cove where pop, rock, art, and hip-hop meet. He’s worked with Gorillaz, Peeping Tom, and Handsome Boy Modeling School and has his own bands like Deltron 3030 and Loveage. But then there is Kid Koala the author/illustrator of two graphic novels; this show, Nufonia Must Fall, is based on his 2003 book of the same name. The live version of Nufonia Must Fall is hard to put neatly into one category: is it a film, a concert, a play, a dance? Or is it secretly a Charlie Chaplin silent film reimagined for the post-nuclear age? The story is as deceptively simple as it is ancient, though with a decidedly modern twist: robot meets girl, robot gets girl, robot loses girl, robot goes on vacation with girl. But it’s done in a way that if it doesn’t pull on your heart strings a little, you might be the one who is the robot. The stage is set with Kid Koala upstage right with enough musical hardware to make Kraftwerk feel a little insecure. He is joined upstage left by the Cecilia String Quartet. 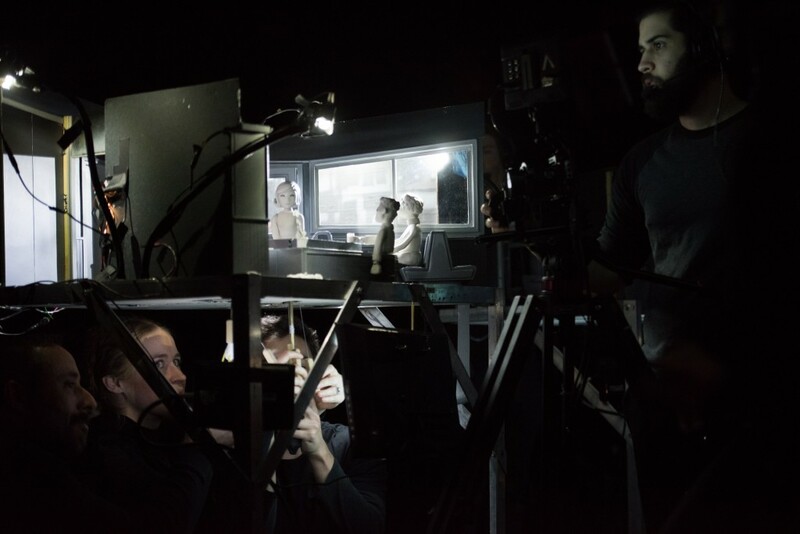 The rest of the stage is filled with a number of small sets, four cameras, and a small army of puppeteers, cameramen, and the like, with the results of their action shown on a large screen at the back of the stage. But this basic description doesn’t come close to describing the joy of seeing magic as it’s performed and the magician’s perspective at the same time. It’s a process that serves as a metaphor for the piece itself: extraordinarily complicated but made to seem easy, almost effortless. That is one of Kid Koala’s gifts. What makes Nufonia Must Fall really connect is that it never feels precious or dainty. It’s accessible but not cloying, smart but not pretentious. It’s the craftsmanship of an old master handled with the informality of a neighborhood shopkeeper. It’s an attitude that takes the big invisible wall that lives between the first row of the audience and the stage and tears it down, Berlin-style. One could argue Kid Koala is a postmodern Charlie Chaplin. More than just a performer, he becomes the architect of the experience, an auteur in the truest sense of the word. Only his version of Chaplin’s Little Tramp is a tape machine robot, always recording but not always experiencing: a piece of out of date technology we can all identify with deep down inside, a robot that is the most human. This might be kindled from one man’s imagination, but it feels like the full group collaboration that it is. The direction by K. K. Barrett is imaginative and fun and gives real fulfillment to the idea of the motion comic. It’s handled with such subtlety and skill that it makes the whole production feel as though it’s unfolding for the first time. Like Chaplin’s best work, Nufonia is a story that transcends language. Simple and direct, the work does not have to be seen as a metaphor, despite working as one. And that is one of its points of genius: it can be savored just as an experience, or as something more profound. The viewer simply takes from it what they would like. In spite of Kid Koala being a musician, this isn’t a piece about the music, per se. The work is more of a digital foley: musical sounds make the soundtrack for his city, the melodic heavy lifting provided by the Cecilia String Quartet. Never are more notes used then needed; this simplicity reinforces the sheer overall charm of the piece. It would be so easy for this story to fall into the trap of being filled with an overblown sense of self-importance or preciousness, given the puppets and animation. Instead, the honesty of Nufonia washes away any and all pretense, and connects to our inner kid. It allows us something so rare in art today: to have a sense of wonder and delight, while at the same time pushing boundaries of stagecraft and form, all in an environment that encourages the audience to let go of intellectualism and just enjoy it. I for one had started to forget that art could be delightful… Thank you for the reminder.